Rural Documentary of small farms and the towns they supported. 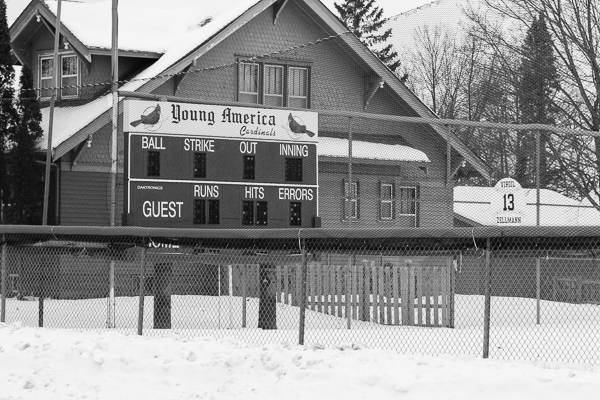 A baseball field in a the small town of Young America awaits the spring thaw as players once again will take to the fields and provide entertainment and enjoyment as locals cheer on their ballers. Young America is a small town of around 3500 people in Carver County. Baseball is a wonderful community sport. There are ample opportunities for folks to come out and watch because of the large number of games. Local rivalries add color and fun to the event. It’s a great way to spend a summer day or evening. This entry was posted in CARVER COUNTY MN and tagged baseball, cardinals, copyright ryan ware, local sports, small town life, small towns, young america. Bookmark the permalink. A true slice of Americana right here in this photo. Well done, Ryan. Thanks. I want to get back there when it’s not all cold and snow and get some colorful shots. It’s a very nice facility. Copyright Ryan Ware 2010-2012. Unauthorized use and/or duplication of this material without express and written permission from this blog's author and/or owner is strictly prohibited. Excerpts and links may by used, provided that full and clear credit is given to Ryan Ware and Fleeting Farms with appropriate and specific direction to the original content.